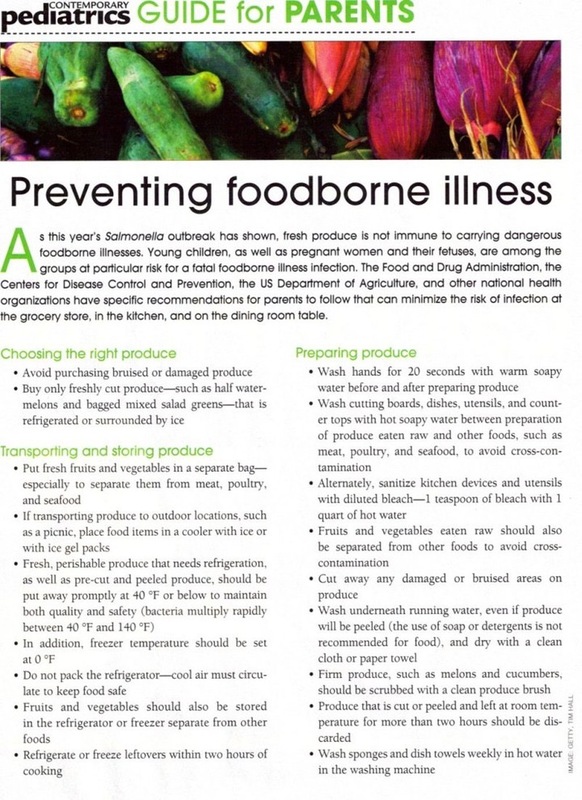 There are several infections that we can catch from eating contaminated food. Fresh fruits and veggies are an important part of our diet, but we need to take precautions to prevent getting the germs that often accompany them. Washing our produce well, and keeping our hands washed are the first step. But there are many other factors, and below is a list compiled by Contemporary Pediatrics from recommendations of the FDA, CDC and USDA. One important and potentially deadly infection from our food is hepatitis A. I strongly urge all my patients to get the hepatitis A vaccine. Much of our fresh produce is brought in from Mexico and other countries where hepatitis A may be common, especially in the winter months. Recent studies have shown a moderate amounts of arsenic contaminating certain foods. One of the highest levels of arsenic was in baby rice cereal. We are now recommending oatmeal powder instead of rice cereal for babies.